We are so happy that you found our website. Since you are here, please take a few minutes to learn more about us. We hope that you will like what you see and consider attending a meeting and joining one of our interest groups. Our annual fundraiser will be held on Saturday, May 4, 2019 at the Canterwood Clubhouse. Please join us for lunch and a presentation by our keynote speaker, Master Gardener Marianne Binetti. Marianne is a gardener extraordinaire, an expert on everything gardens. Come hear her tell us how her dad, who was a doctor, and her mom, who organized a household of 16 children, shaped her love of science. She’ll also tell us about her “Tips for Lazy Gardeners” and show us some pictures of some of the best gardens she has ever seen. Marianne has a degree in horticulture from Washington State University and writes a syndicated gardening column that runs in over a dozen newspapers each week including the The Tacoma News Tribune (Sundays). She has also written or co-written 10 gardening books including “Easy Answers for Great Gardens” and her latest book “Edible Gardening for Washington and Oregon” She lectures and gives seminars on a variety of topics. Marianne leads garden tours around the world with her husband Joe. Please mark your calendars and invite all your gardener friends to come. For tickets, go here. Congratulations to our board and members for another successful year with AAUW! 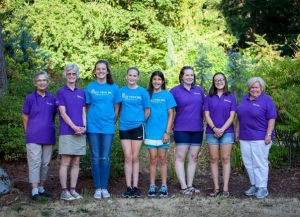 In 2017-2018, we funded three scholarships for girls graduating from Gig Harbor high schools and raised enough money to send ten girls to Tech Trek camps at PLU and EWU. We also had many interesting programs and interest group meetings. Nine of our members went to the state AAUW Lobby Day and helped us move ahead on priority legislation on pay equity and student loan debt. AAUW-Gig Harbor exists for many reasons. First and foremost is that we are a group of like-minded women who enjoy getting together. We are eager to learn, strive to be engaged on the local, state, and national levels, and want to have a good time. 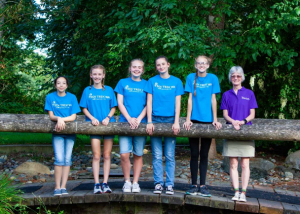 We take stands on public policy, support our brightest and best female high school seniors with college scholarships, and support the Tech Trek program by making it possible for several of our local 7th grade girls to attend a week long STEM camp on a nearby college campus. We’re convinced that once you learn more about us, you’ll be excited about what we do. Please take a look. We’re eager to meet you!